The thriving town of Blacksburg, Virginia, is known for many things: Virginia Tech, modern art, a hip brewing and gastronomic scene, a lovely temperate climate, and easy access to the rolling hills and slew of outdoor activities surrounding the ancient New River Valley. Area mudslingers, however, know it for something especially gnarly: top-tier mountain biking. 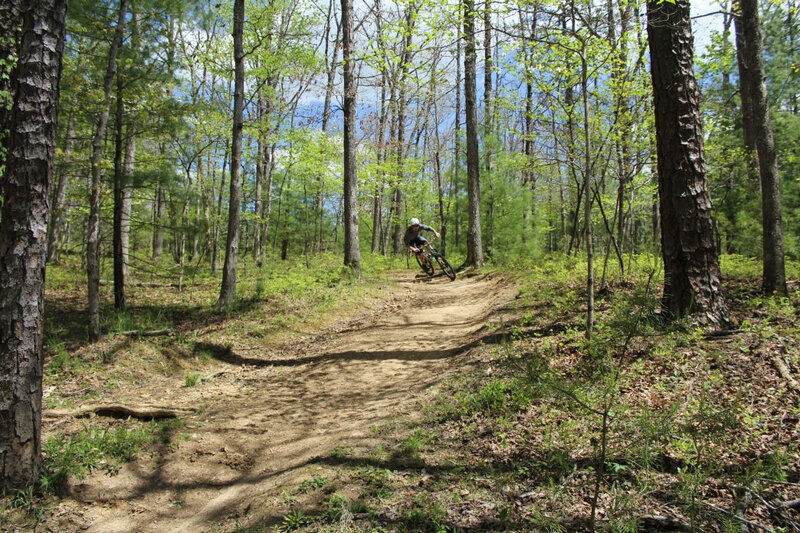 Tucked away in the Jefferson National Forest, the Pandapas Pond Day Use Area and Poverty Creek Trail System offers a wide variety of riding just a short drive—or bike ride—from Blacksburg. 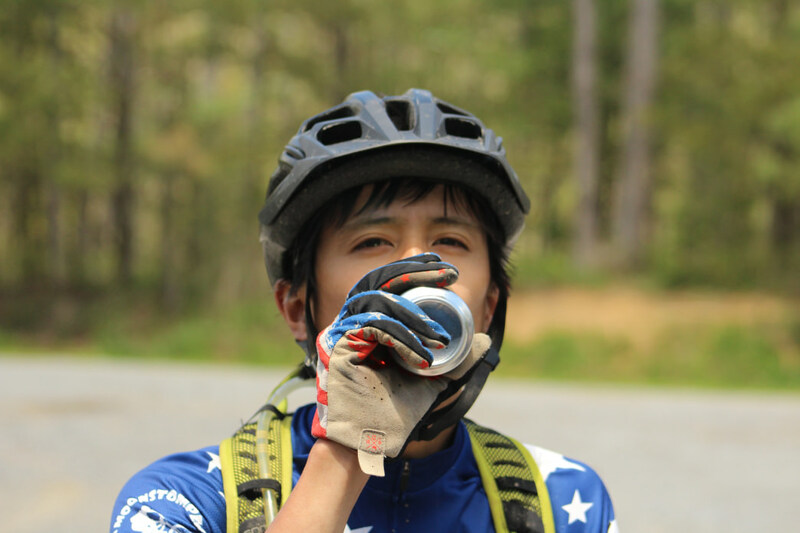 Variety is the name of the game at Pandapas Pond, and 19 trails provide more than 30 miles of mayhem across the mountain biking spectrum. Greenhorn beginners, downhill shredders, and technical gurus alike will have a field day on rolling singletrack, rough rock gardens, heart-stopping switchbacks, and soul-crushing climbs. Trail difficulty is marked with International Mountain Bicycling Association (IMBA)-designated signage and is well-posted at most intersections. The symbolism is equivalent to that of the ski world (green circle=easiest, blue square=intermediate, and black diamond=most difficult), offering a simple and recognizable hint at what riders should expect around the next bend. A "Muddy Trails Meter" at the Pandapas trailhead kept current by daily users even offers a glimpse of what to expect when the unfavorable weather has made things uncertain. If the slider is set to Poor, consider riding drier trails or gravel roads to prevent resource damage on muddy trails. To get there from Blacksburg by car, head West on US-460 (Pandapas Pond Road) for 3 miles and turn left onto Forest Service Rd 808—the parking area is immediately on the left. 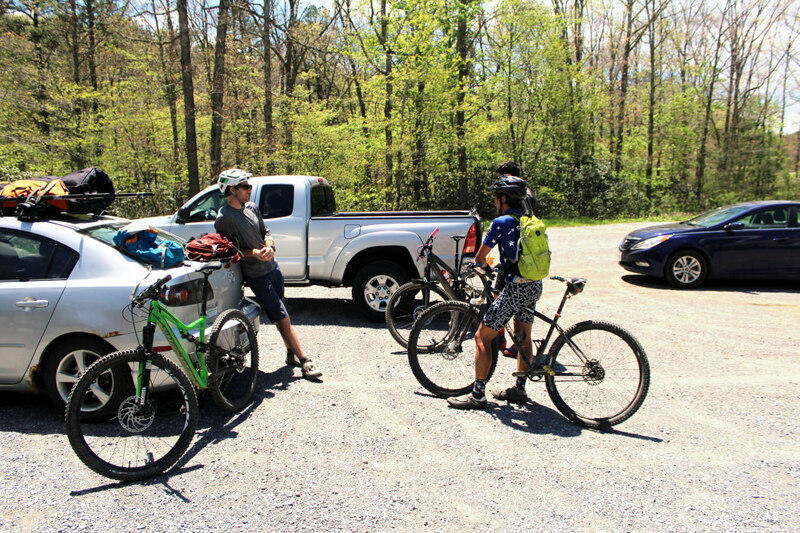 Those looking to really rack up the miles can ride from town on the Huckleberry Trail, one of Blacksburg’s popular Greenways. Head north from Gateway Park and climb 768 feet up the Gateway Trail to reach the top of the mountain and access to several heart-thumping descents. From the Pandapas parking lot trailhead, riders have several options. Beginners can cross FS 808 and hop on the Poverty Creek Trail, a green circle/blue square-rated trail that covers 4.4 miles of singletrack. Don’t get too complacent—several creek crossings and technical rocky sections may convince some to walk-a-bike. The far reaches of Poverty Creek tend to hold water and become overgrown well into the season, so be prepared for the Appalachian jungle. Intermediate riders can climb 0.8 miles up Horsenettle and hang a right onto the intermediate roll of the Joe Pye Trail, dumping you out near Pandapas Pond and the Poverty Creek Trail. Hang a left onto Poverty Creek and climb Royale to access the technical rock gardens of Prickly Pear. To access the black diamond descents at the top of the mountain, climb the relentless Horse Nettle Trail until it joins Forest Service Road P188-2. Catch your breath on the remainder of the mild gravel ascent and prepare yourself for the fun part. Advanced riders will want to test their switchback skill on the double-black diamond descent of Snakeroot. Dropping nearly 800 feet of vertical in 2.3 miles, Snakeroot will put your suspension and brakes to the test. The top half is characterized by narrow, steep, and technical singletrack—don’t feel ashamed if you have to put a foot down around some of the hairpin turns. The banked turns and airy humps of the flowy bottom half will make you forget the dismounts. Because all Pandapas Pond trails are on National Forest land, all riders are encouraged to check the kiosks and signage when preparing for a ride and to follow all rules and regulations governing the area. If it’s super muddy out, stay on the gravel or hit the road. Pandapas Pond is a multi-use area that attracts horseback riders and hikers, so be cautious when ripping that downhill section. One of the best parts of Pandapas? It’s totally free, meaning you’ll have extra cash in your pocket to visit one of Blacksburg’s heady craft breweries and tend to your jelly legs and empty belly. For post-ride fuel and libations, check out Lefty’s Right Mind Brewing, Bull & Bones Brewhaus, or the Blacksburg Taphouse. If you went too hard and blew through your tubes or your derailleur, swing by East Coasters Bike Shop on South Main Street and let the techs work their magic. Or swing by pre-ride to get the most up-to-date info on the trails: These guys ride Pandapas almost daily and are happy to share their knowledge with visiting riders. Who knows, maybe they’ll even invite you out on the trail. There’s a reason so many cyclists choose to call Southwest Virginia home. Lube up the chain, pack some spare tubes, and go find out why.